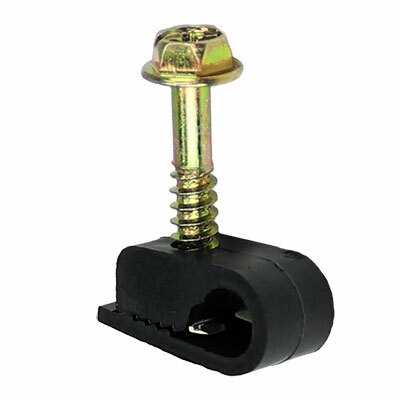 This 1/2" black grip clip allows you to hold a single coax cable line by inserting the line into the clip and then screwing it into the desired location. This prevents the cable from being easily snagged by securing it in an out-of-the-way place. This grip clip penetrates the surface of resistant material 1/2" allowing for a deeper gripping of the screw. DIRECTV approved. Each bag contains 100 clips. These models penetrate the surface 1/2” which is useful when inserting into a resistant material to allow for deeper gripping of the screw.